Windows 9 may arrive sooner than most think. According to a new report from The Verge, the successor to Windows 8 is slated to debut at a special media event on September 30 - a date that lines up nicely with previous reports of a late September, early October unveiling. Microsoft's next major OS release, codenamed Threshold, will likely be released to developers and enthusiasts on that date as a preview version. 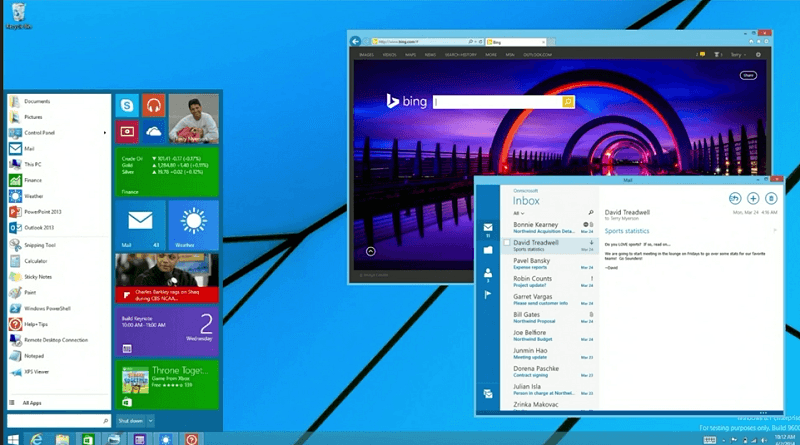 The long-awaited return of the Start Menu is just one of the many features expected in Windows 9. Microsoft is also planning to remove the Charms bar and make several UI changes - essentially dialing back the radical redesign that was Windows 8. Microsoft is reportedly working on builds of Threshold that include Cortana, Microsoft's personal virtual assistant. It's unclear, however, whether or not it will make the initial tech preview build. Aside from these features, it's anyone's guess as to what else Threshold will deliver. Another unknown is whether the preview will be available to everyone or if Microsoft is only planning to release it via TechNet and MSDN. In related news, Microsoft may also fill us in as to the fate of Windows RT which is being integrated into Windows Phone as part of the company's unified Windows vision. No word yet on how far along Microsoft is into this project but we'll likely find out next month.